Each week, Big Issues focuses on a newly released comic-book issue of significance. This week, it’s Suicide Squad #20. Written by Ales Kot (Wild Children, Change) and drawn by Patrick Zircher (Mystery Men, Shadowman), it’s a brutally intense issue that puts the supervillain team in a position to grow by tearing down the individual members. Warning: Spoilers ahead. When John Ostrander’s Suicide Squad debuted in 1987, it was a revolutionary title that took DC’s most despicable villains and put them in a position to reduce their prison sentences by working for the U.S. government. The original series mixed superhero action with political commentary and remarkable character development, lasting for 66 issues but continuing to impact the DCU long after its cancellation. Titles like Checkmate and Secret Six were indebted to Ostrander’s work, but when Suicide Squad launched as part of the New 52, it lacked the sophistication and depth of the original series. Adam Glass’ take on the team was ’90s extreme, providing plenty of action but never really giving strong reasons to care for these characters that were risking their lives. Considering how important this team’s mortality rate is for building the stakes of this book, a lot of characters died and came back to life in Glass’ run, with Yo-Yo, Voltaic, and Deadshot all being revived. (Deadshot came back twice.) 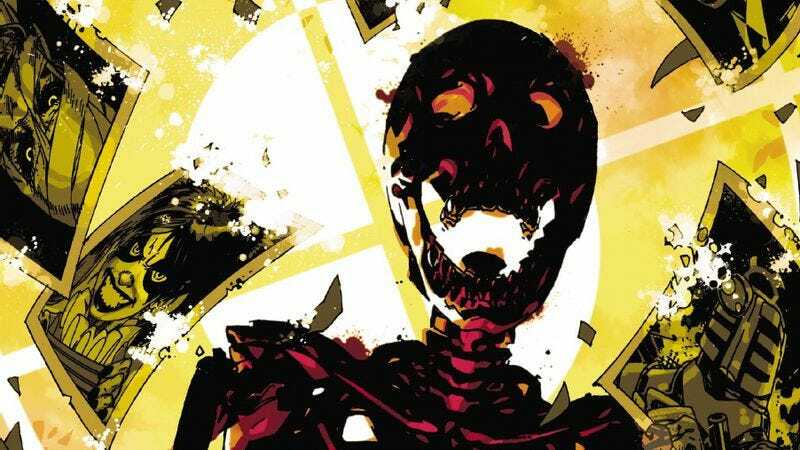 The most important thing that new writer Ales Kot does with Suicide Squad #20 is bring back that sense that anyone could die at any moment, and it will be permanent. A member of the team dies by the end of this issue, and there’s no coming back for him, but he’s not a casualty of some espionage mission Amanda Waller sends Task Force X on. He’s a casualty of Amanda Waller herself, who asserts her dominance over her captives with the help of her lackey, Unknown Soldier, and a mysterious new member. The issue starts off with a four-panel sequence showing the swamplands outside Belle Reve penitentiary while an unknown narrator talks about how this is the day where everything changes. The action in these panels follows a crane that is being eyed by a hungry alligator, but manages to fly away just as the reptile snaps its jaws at the bird’s feet. The crane flies away in the direction of Belle Reve prison, and the page ends on a panel that emphasizes the American flag hanging outside of the prison, reminding readers that the good ol’ U.S. of A. is responsible for the disturbing events to come. It’s an effective use of symbolism that immediately separates Kot and Zircher’s take from what came before, which was a far more traditional superhero title except that the main characters just happened to be immoral. Those opening panels can be interpreted in a variety of ways: Does the crane represent Amanda Waller, and does the alligator represent the criminals that she keeps locked up? Vice versa? Or does the crane’s escape symbolize the freedom that the team’s characters are denied? And then there’s this issue’s narrator, whose presence is going to considerably change the dynamic of this title. Is he an alligator or a crane? That ambiguity is going to be a big part of the title moving forward, and Kot spends this first issue fleshing out the villains and showing that they are more than just living weapons who will kill when they hit the battlefield. In revealing the fears and motivations of these characters, Kot humanizes them while making their sadistic captor, Amanda Waller, the biggest bad in the book. As Kot’s first work for one of the Big Two comic book publishers, Suicide Squad #20 is a spectacular debut that suggests a bright future for the writer if he chooses to pursue more superhero titles. His Image comics Wild Children and Change employed chaotic, off-kilter storytelling to tell psychedelic stories about youth in revolt and adult identity crises, but Kot’s writing is much more controlled in Suicide Squad. In an interview with USA Today, Kot described his approach for the title: “It's basically Monty Python meets Grindhouse, but directed by Michael Bay—heavy on action, heavy on thrills, but at the same time with this absurdist, over-the-top bent that hopefully pulls it all together.” That description focuses on the action and the humor, which there is plenty of in this issue, but fails to include the personal character development that makes #20 such a success. After consistent insubordination from her team, Amanda Waller decides that it’s time to show Task Force X who is boss, bringing in serial killer James Gordon Jr. to analyze the team and find out the best ways to break the spirit of each member. James is also this issue’s narrator, and while his identity is kept a secret until the final page, it’s not too hard to guess. Anyone who read “The Black Mirror” storyline in Detective Comics will recognize the shadowy figure attached to the “Classified” caption during the roll call at the beginning of the issue, as Francesco Francavilla used the combination of clean-cut hair, glasses, and shadow as James’ visual signifier. The big shocker comes after the reveal of James’ identity with the final line of the issue, exposing why this is the day that everything changes for Commissioner Gordon’s insane son. After Waller shuts down his request that he be allowed to call her “mother” because it would help him concentrate, he smiles at her as he thinks about this special day: “The day I fell in love with Amanda Waller.” A character as mentally unstable as Gordon who becomes infatuated with his jailer creates all sorts of possibilities for future stories, and it will be interesting to see how these allegiances shift throughout Kot’s run on the series. Gordon and Unknown Soldier are firmly in Waller’s pocket, Deadshot has a personal vendetta to see Waller dead, and King Shark and Harley Quinn are wildcards. Then there’s poor Voltaic, the electricity-generating character that didn’t really do anything during Glass’ run on the title, so he’s killed off. What happens to him? Take a look at Jason Pearson’s eye-catching cover for this issue. With James and Unknown Soldier’s help, Amanda Waller instills some discipline in her team by any means necessary. In Voltaic’s case, that means getting beaten to death by Unknown Soldier after he talks about how the bandaged military man probably killed kids in whatever “–istan” he was stationed in. When he’s pumped full of the Samsara serum that allows Waller to revive her deceased inmates, his body can’t handle the drug and explodes, painting the walls with his insides and making him 100 percent permanently dead. The Samsara serum is also what has brought Deadshot back to life after his two deaths, giving Waller the power to deny Floyd Lawton his greatest wish of a remarkable end to his life. As Waller reveals all this to a newly revived Deadshot, he vows to kill her one day, assuming he doesn’t blow up into a bunch of tiny pieces first. In order to break King Shark and Harley Quinn, Waller and Gordon turn to those characters’ pasts to manipulate their emotions. Kot’s interpretation of King Shark is a refreshing left turn from his past portrayals; he introduces him eating vegan Reuben sandwiches and reading The Essential Rumi in his jail cell. Waller thinks that this is all an act and that King Shark is still ruled by his animalistic impulses, whereas James tells her that the man is trying to cope with an abusive father who never tried to understand him and called him a freak 10 times a day. To test their theories, they invite a beautiful blonde robot to seduce King Shark, then slap him around and call him a freak. Waller wins as King Shark bites through the robot’s body, crying as he chews before Waller sends a surge of electricity through his body. For Harley Quinn, Kot turns to Batman: The Animated Series for help in tearing down the clown, using quotes from her origin story “Mad Love” to get an emotional response, when a man dressed as the Joker comes into her cell with a knife. Gordon tells Waller that these are trigger phrases that will set off Harley, but he underestimates her allure and her intelligence. When she sees the Joker imposter, she asks “Seriously?” before playing along with the ruse, and her charisma forces her would-be attacker to drop the disguise and ask for an autograph while he has the knife in his hand. That’s when Unknown Soldier comes in to shoot the faux-Joker in the head and save Harley’s life, but she’s not so easily tricked into handing over her allegiance. As she tells Unknown Soldier that he’s her hero, she pockets the dead man’s knife. Gordon tells Waller that Harleen Quinzel was an extremely intelligent psychoanalyst, and it looks as if Kot is running with that idea to make Harley one of the most dangerous players on the team. Patrick Zircher has grown immensely as an artist in the past 10 years, moving from a traditional superhero look to a style that is more grounded in reality with more textured inks and panel layouts that read more like crime noir than costumed adventure. Harley Quinn’s skimpy redesign was one of the more controversial developments of Glass’ run, but Zircher renders the costume with a level of detail that makes it look like a cosplay creation. It gives the impression that the look is primarily for show rather than function, and when she’s relaxing in her cell, Harley covers up in a Hello Kitty onesie. Suicide Squad requires an artist that can draw action, and Zircher brings a grisly power to the bursts of violence that explode throughout the issue. He makes great use of Scrabble pieces to create onomatopoeia when Unknown Soldier hits Voltaic with his nightstick, and the shot of King Shark biting through his robot seductress captures all the strength of the team’s heaviest hitter. Jason Keith is a colorist primarily associated with Marvel Comics, and his work on this title stands out from the rest DC’s current output. He uses a limited color palette that uses specific hues for different scenes, blanketing Amanda Waller and her guest in warm reds and oranges that contrast the cool blues of King Shark and Deadshot’s quarters. When Waller speaks, her text is a garish neon green that clashes with every color on the page, showing just how much authority she has. Even when she’s not on the page, Amanda Waller is pulling attention to her, and after the events of Kot, Zircher, and Keith’s first issue, the members of Task Force X have learned what readers have known for the past 25 years: You don’t mess with the Wall.